Colin Rae Brown, who founded the Burns Club of London in 1868, was a native of Greenock and President of its famous Burns Club in 1843. A wealthy newspaper proprietor, he came to London in 1863 and held the first of twelve grand Burns dinners in his Kensington town house with himself as chairman and chief orator. As these celebrations grew in popularity he guided the Club to full maturity. He was also largely responsible for the formation of the Burns Federation in 1885 and as a result of his endeavours our Club is No. 1 on the Federation's worldwide roll. Italy's great patriot, Garibaldi, was our first Honorary Member. 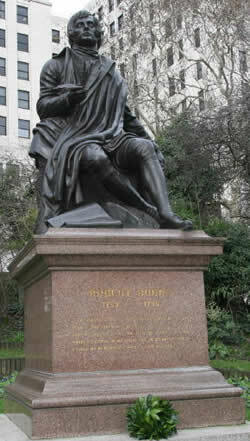 John Gordon Crawford who gifted the Burns Statue on the Embankment was an early member, as was Sir John Steel, sculptor of the Burns bust in Westminster Abbey, unveiled in 1885 by the then Prime Minister, Lord Rosebery. 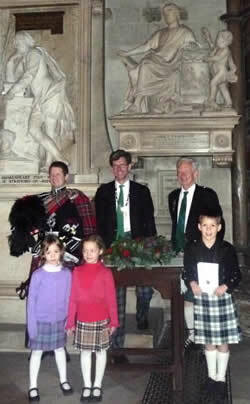 The Club flourished and in l921 finally joined forces with the London Robert Burns Club (Scots). By this time the great William Will was a leading figure not only in the Burns Club but also in every important London Scottish organisation of the period. He founded our Vernacular Circle, a project adopted by many Burns Clubs around the world. He was still active in 1956 at the age of 89 and his influence lives on in our annual William Will Memorial Lecture. The bicentenary of the Poet's birth was celebrated by a magnificent dinner at the Criterion, with the Rev Dr Scott of St. Columba’s Church proposing the ‘Immortal Memory’. The Club’s own centenary was marked by a grand Hallowe’en Dinner at the Piccadilly Hotel, with Jimmy Mason, who went on to be our Honorary Life President, presiding. Jimmy died on 21 July 2001 at the age of 96. The Burns Federation's Centenary Conference was held in London in 1985 and hosted by the Club. In 1988 we became "twinned" with the London (Ontario) Burns Club. The passing years have seen many changes in the nature and activities of the Club and we have been privileged in having many distinguished gentlemen - and three ladies - as our Presidents. Demolition of the old Royal Scottish Corporation premises in Fetter Lane left us without a regular home for a time, until we settled down happily in Crown Court Church Hall, where we remained for a dozen years or so. Then, thanks to the efforts of Past President Alex Wilson, we moved to The Caledonian Club in Halkin Street. There we still have on show the famous Thomson Vase, presented to George Thomson, publisher of Burns songs, in 1847. We then returned to the fold of the Royal Scottish Corporation and held most of our meetings in their new premises in King Street, Covent Garden for several years until changes to the interior of the building meant that was no longer feasible. The Caledonian Club has once again become our regular meeting place and it also houses our fine collection of Burns books. Through the energetic offices of our Past President David Cullens, in 1996 a splendid year was organised by the Club to commemorate the bicentenary of Burns’ death. This culminated in a Grand Commemorative Dinner at The Café Royal in July of that year. We recently celebrated the 250th anniversary of the birth of Robert Burns with a superb Birthday Festival Dinner at The Caledonian Club and with a memorable service of commemoration in Westminster Abbey on 25th January 2009. The Burns Club of London celebrates the birthday of Robert Burns with a superb Festival Dinner. This is a black tie event and has all the traditional ingredients of a Burns Supper and ends with around 2 hours of ceilidh dancing to live music – great fun!